Thimbelina: Miss Emily turns 7 & Giveaway received! Today we're attending a birthday party for Miss Emily who turned 7 on Thursday so I decided to make another pencil roll. Since I wasn't 100% happy with how my last pencil roll turned out (even though Miss Katie loved it) I decided to use a different tutorial by Cassie from You Go Girl! instead. This tutorial was soooo easy to follow and combined with Cassie's No Snit binding tutorial resulted in a very neatly finished project. I'm delighted with how it turned out and can see that i'll be making many more of them. Thanks so much to Cassie for sharing your wonderful ideas! 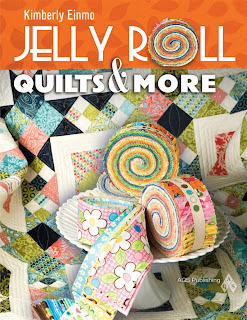 On another exciting note: I was lucky enough to receive my parcel from Kimberly of Quilting with Kimberly yesterday....... A signed copy of her beautiful new book "Jelly Roll Quilts and More" and isn't it delicious! It's full of lovely projects and ideas and even includes some yummy looking recipes...... sorry my pics aren't great! Thanks so much for the giveaway Kimberly.... I love it! I'm absolutely delighted you like my new book! Love your photos -- and can't wait to see what you'll do with that Jelly Roll! :-) It just tickles me more than you could know to see the open page I signed and know it is halfway round the world! Happy stitching! Love the pencil roll, I need to make some of these for my nieces and nephew. I also like the pretty star pattern in the book. Looks like a great book, congrats on the win.